The present research paper describes the sacred plants of the Indo-Gangetic plain and their associated deity and festivals. Several intensive surveys were carried out to findrnthe definite role and importance of nine sacred plant species in the Indo-Gangetic plain, India in the life style, religious activities and health care. These sacred plants are used in variety of ceremonies in various ways throughout the year by the people of study area. Furthermore, these plants are considered as sacred due to their medicinal, aesthetic and natural qualities. Thus, our ancestors linked various God and Goddess with several plants for their conservation and named as sacred plants. These ancient beliefs show the human relation with plants which are also helpful in the conservation of plant species for their valuable qualities. Fig. 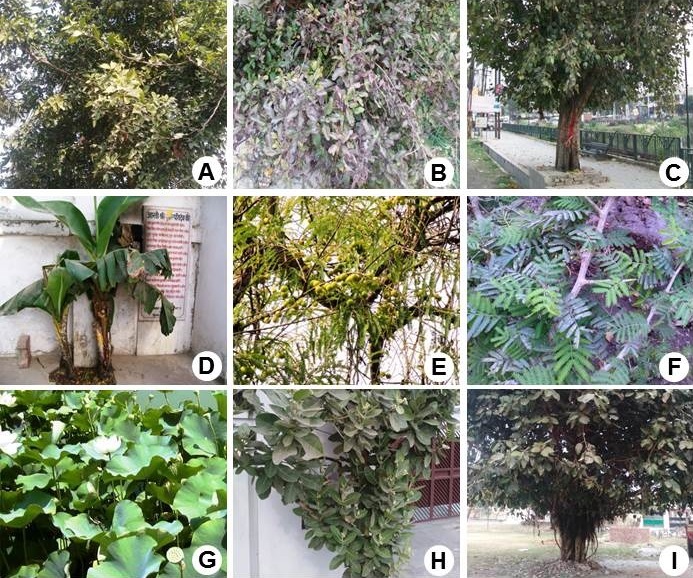 : Some sacred plants: A, Aegle marmelos (L.) Correa; B, Ocimum tenuiflorum L.; C, Ficus religiosa L.; D, Musa balbisiana Colla; E, Phyllanthus emblica L.; F, Prosopis cineraria (L.) Druc; G, Nelumbo nucifera Gaertn. ; H, Calotropis gigantea (L.) Dryand. ; I, Ficus benghalensis L.